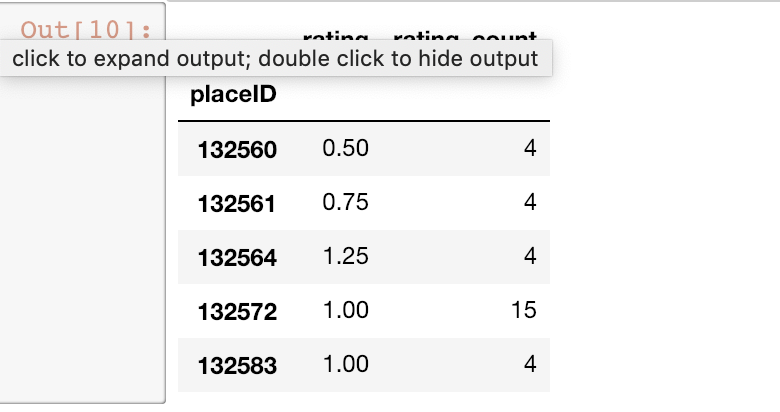 As I mentioned on my previous post, I would share a step by step tutorial to develop a recommendation system with Python Machine Learning and AI from Lynda. 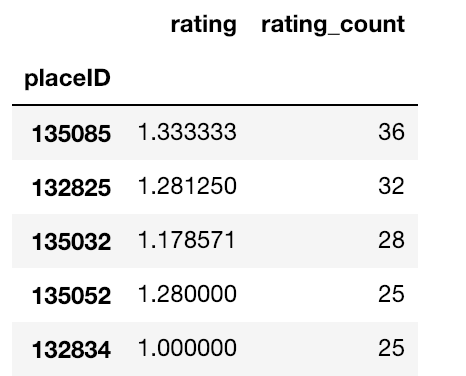 On this tutorial, we are using Pearson’s R correlation to recommend an item that is very similar based on user’s action. If you haven’t, please install Jupyter Notebook as this will be your playing ground. We started by running this command on your terminal. For this tutorial, please download these csv files. 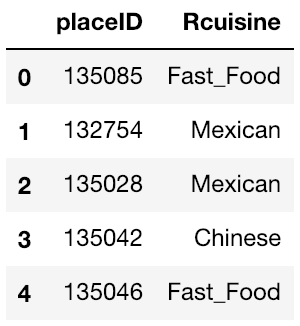 On this particular tutorial, we are using datasets of places to eat and restaurant goers. The recommendation will be highly based on user reviews similarity. And followed by reading the data, in this case, csv files to be accessed by the program. Datasets we are using actually come from Mexico. These datasets are hosted at the University of California Irvine Machine Learning site. However, they were published by Blanca Vargas ETAL. Previously, we have the place ID and restaurant Name. Then, we want to have a look at the rating column. 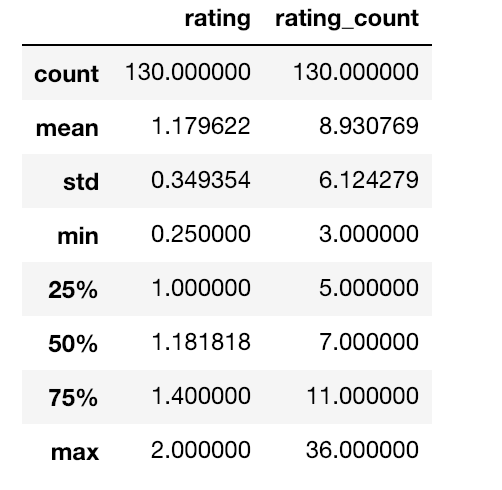 We want to find out the mean value for each ratings. 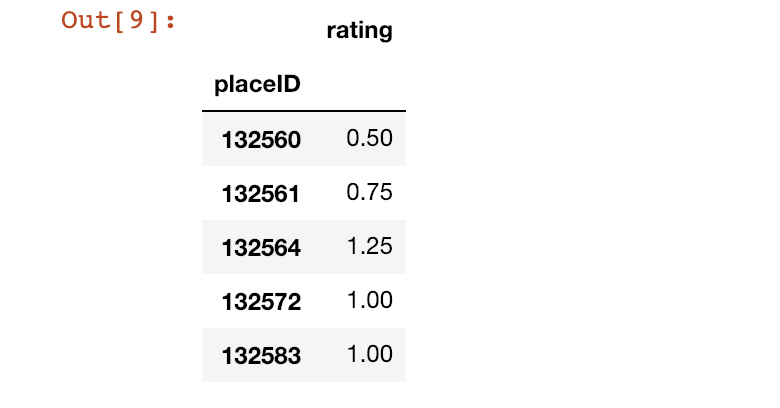 Now we are going to add a column called Rating Count, then we will generate the number of how many reviews each place received. From this picture, we can see that there are 130 unique places that have been reviewed in the rating data frame. Additionally, there is a max value of 36. This means that the place that have got the most review has received 36 reviews. We will check what is that particular place. Next, we are going to see which restaurant that has 36 reviews. The place with ID 135085 turned out to be Tortas locas Hipocampo. Next, we will check what kind of cuisine Tortas locas Hipocampo serving. On this section, we will call a function named pivot table. This function is aimed to cross tabulate each user against each place, and output a matrix. And you notice that there are many cross tab that is full of nul values. This is because there are only few people that actually review places. Next, we will see how we can use it to find places that are correlated. At this section, we aim to find correlation between each of the places and Tortas restaurant. This is achieved by calling the core with method of our places cross tab, and then pass it the Tortas rating series. We are going to generate a Pearson R correlation coefficient between Tortas and each other place that have been reviewed in datasets. Let’s try to make some sense here, if we have found a restaurant that seemed to be correlated with Tortas but only had, say, two ratings total, then it might not be similar to Tortas at all. As a result, the correlation really wouldn’t be significant. 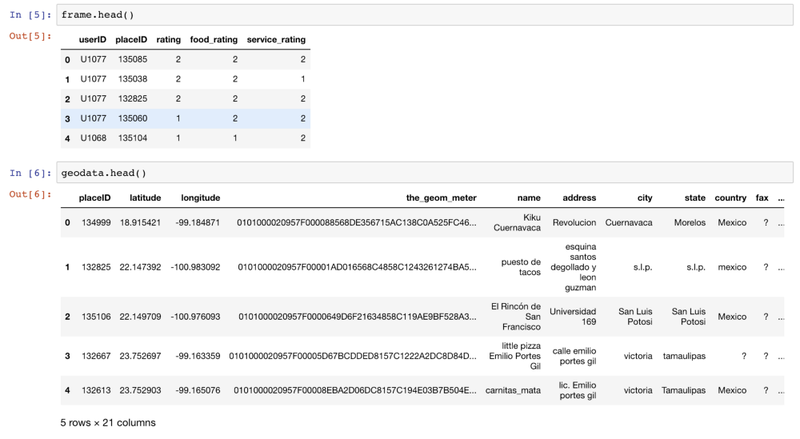 Then, let’s create a filter that showing the restaurants that have at least 10 user reviews. 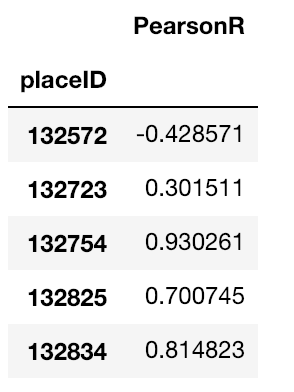 Let’s look at the Pearson R correlation coefficient sorted in descending order. If you are aware, there are places that have 1 Pearson R value. 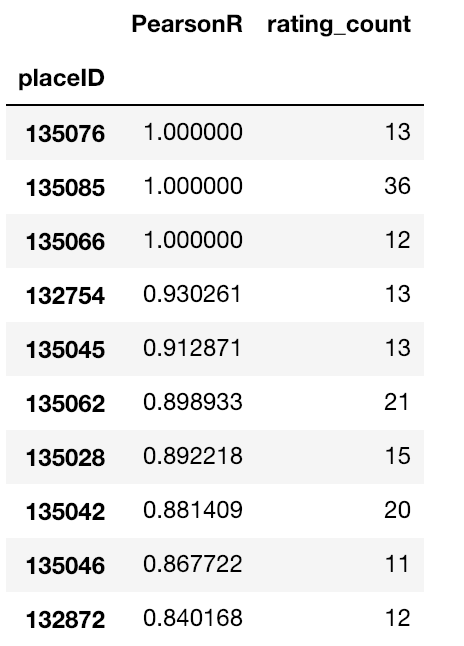 These one values are not meaningful here. The reason is because is in those places, there was only on user who gave a review to both places and gave them same score. As you can see from summary table, places that were not displaying is because the data is not listed in the cuisine’s dataset. That’s it. It might look a bit complicated. On the next tutorial, I will use machine learning algorithm for the test, which be a lot simpler. Any feedback, suggestion and correction are most welcomed.